Upon arrival at Budapest Liszt Ferenc International Airport, transport to the hotels listed in this Guide will be available to all participants. WHO Regional Committee reception desks will be located outside the arrival halls at terminals A and B of the airport to assist participants and to arrange transportation to the hotels. In order to facilitate this process, please indicate flight details and hotel accommodation on online registration. Heads of delegations and delegates traveling with them will be provided access to the Government Lounge at the airport both on arrival and departure. Hungary has a continental climate. September is generally warm with an average daytime temperature of 22° C.
For up-to-date weather forecasts, please visit this website. Dress is informal for all occasions. Credentials should be issued by the Head of State, the Minister of Foreign Affairs, the Minister of Health or any other appropriate authority, such as permanent missions or senior government officials. Although a copy of the credentials must be submitted online, Member States are required to deliver the original credentials to the WHO Secretariat (Regional Governance Unit), preferably at registration, before the official opening of the Regional Committee session. In accordance with Rule 1 of the Rules of Procedure of the Regional Committee for Europe, not more than two representatives may be nominated by each Member State; however, alternates and advisers may accompany national representatives. The currency unit is the Hungarian Forint. Exchange rates for other currencies are subject to change on a daily basis. The 67th session of the WHO Regional Committee for Europe (RC67) will open on Monday, 11 September 2017, at 09:00 and will close on Thursday, 14 September 2017. 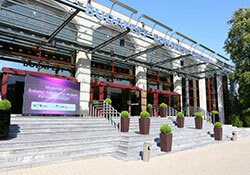 The session will be held at the Budapest Congress Center in Budapest, Hungary. Please note that RC67 is a smoke-free event. The main electricity voltage is 220 V and 50 Hz. The central European-type wall socket (two-pin plug) is standard in Hungary. All delegations and participants are requested to submit fully completed forms to the hotel of their choice in line with the guidance provided in the Guide no later than 31 July 2017 in order to reserve rooms at the preferential rates. Please note that the WHO Regional Office for Europe cannot undertake to guarantee accommodation or rates for requests received after 31 July 2017. The Secretariat cannot accept liability for personal accidents or loss of or damage to the private property of participants or accompanying persons during or indirectly arising from attendance at RC67. Participants should make their own arrangements with respect to health and travel insurance. Internet access and printing facilities will be available to participants during the session. Stationary PCs will be available in the Internet café. Participants with personal laptops and smart phones will have wireless Internet access in common areas and meeting rooms. A charging station for mobile phones and laptops will be located in the foyer of the Congress Center. Shuttle buses will be organized each day to transfer participants between their hotels and the Budapest Congress Center. Transportation in connection with social events will also be provided. Participants should check the timetables and notices displayed in the lobby of their hotels and at the session venue. Transportation will only be provided to and from hotels listed in this Guide. Delegates not staying at the hotels recommended in this Guide must organize their own transportation to and from the Congress Center. A lunch buffet will be served at the venue every day from Monday, 11 September, to Thursday, 14 September, courtesy of the Ministry of Human Capacities of Hungary. There will also be two refreshment breaks (morning and afternoon) each day. Photographs and videoclips will be taken during the session, and images and footage of participants and proceedings may be posted on the Internet and the RC67 App. Participants are encouraged to engage in conversation through the RC67 App, to be available two weeks prior to the session. They may also join the Twitter chats about RC67, using the hashtag #RC67. Online registration is required for all sessions of the WHO Regional Committee for Europe. A link to the electronic registration system was included in the letter of invitation that was circulated to Member States in June. Online registration allows access by one focal point per delegation. Once the focal point is entered in the registration system, he or she will receive an email with the link to the registration system and a unique user name and password. The role of the focal point is to register the names of all members of the delegation and to upload a copy of the credentials to the system. The Regional Governance Unit at the WHO Regional Office for Europe verifies the information received from focal points; this information is then used to generate name badges and the provisional list of participants. After registration in the system, participants can provide information on travel plans, hotel bookings, dietary requirements, accompanying persons, social and side event participation and so on, through online registration at any time prior to the close of registration. This procedure applies to all categories of invited participants. Member States are encouraged to include WHO national counterparts in their delegations. Online registration for RC67 should be completed no later than Monday, 28 August 2017. Registration will open at 10:00 on Sunday, 10 September 2017, in connection with pre-meetings taking place at the venue, and will continue on Monday, 11 September, from 08:00. Name badges will be issued at registration. A provisional list of participants, compiled on the basis of the credentials received by the Secretariat by 18:00 on Monday, 28 August 2017, will be distributed at the opening of the session. Participants are requested to check the information contained in the provisional list of participants and to report any changes or corrections to the Secretariat for inclusion in the final list. Stay alert: watch your luggage and briefcase or handbag; avoid displaying attractive and valuable items. Always ask for proper identification before surrendering your passport. Be particularly vigilant at the airport, train station and when checking into your hotel. Please register for social events by email to eurorc67@who.int no later than 5 September 2017. According to the Rules of Procedure, delegations wishing to have draft resolutions distributed to the Regional Committee should submit them to the Secretariat at least two days before the proposal will be discussed to allow time for translation into the working languages, reproduction and circulation to delegations. The Secretariat is available, upon request, to provide logistical, editorial or information assistance as required. A valid Schengen visa to enter Hungary is required for nationals of the following countries: Albania,* Armenia, Azerbaijan, Belarus, Bosnia and Herzegovina,* the Former Yugoslav Republic of Macedonia,* Georgia, Kazakhstan, Kyrgyzstan, the Republic of Moldova,* the Russian Federation, Serbia,* Tajikistan, Turkey, Turkmenistan, Ukraine and Uzbekistan (* = only for holders of non-biometric passports). Participants are advised to check visa requirements when making their travel arrangements. The processing of visas may take up to 15 days (legal basis: Article 23 (1) of the Visa Code). The official WHO invitation letter should accompany visa applications. If you would like the Regional Office to support your visa application, send a request to eurorc67@who.int. If a Hungarian diplomatic mission or consular post is not present in your country, you can find instructions on where to apply for your visa on the same website as the general instructions for obtaining a visa. Please note that participants are requested to bring all documents to the session, as hard copies will be available only by request in order to make the session a “green” event. The official documentation of RC67 is available in English, French, German and Russian on the home page of the Regional Committee.